The lorry blockade on a major South African route between its two largest cities of Johannesburg and Durban seems to have been caused by anger at trucking firms reportedly employing foreigners as cheap labour. 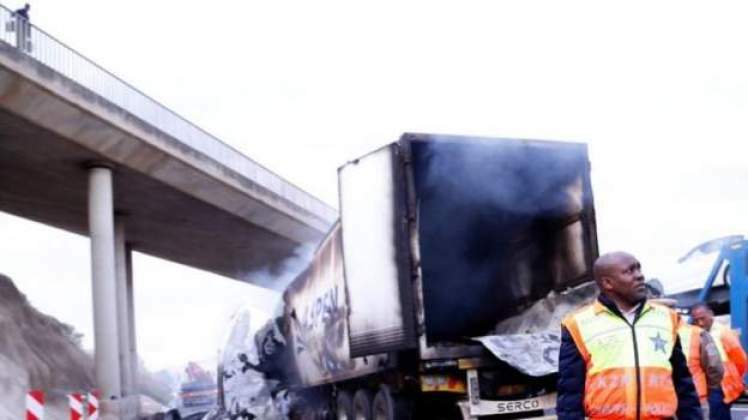 Many lorries were seen burning near the Mooi River tollgate on the N3 in KwaZulu-Natal. "The Mooi River community said they were protesting against truck owners hiring only foreigners," Col Thembeka Mbele told BBC. At least 50 people have been arrested, including some lorry drivers. The protesters were initially complaining about poor working conditions, which they said the migrants had accepted. South Africa has seen its fair share of xenophobic violence in the past. Its worst outbreak of violence against foreigners was in 2008, when more than 60 people died. Many unemployed South Africans accuse migrants of taking their jobs. But there is no evidence to show that any foreigners were targeted specifically because of their citizenship this time around. Ishmael Mnisi, from the national transport department, told me the protests overnight were similar to those over the Easter weekend in the same area. He said violence and looting were criminal offences and if anyone had labour-related complaints, channels were already in place to deal with such disputes. The N3 route has now partially re-opened.